Video Editing Software: watermarking, video editing, bluring video or photo, converting, batch processing, ets. Welcome to the official website of VideoCharge Software company! Below you can see the latest news about our company as well as the list of our products. Besides, we are ready to consider any proposals of collaboration and to take orders for software development. Feel free to contact our support team for details. Videocharge Studio is a video editing software which is intended for those users who regularly work with video, create Internet video galleries, convert video files. Videocharge Studio includes all features for video editing: video converting, splitting video into parts, joining several video files into a single one, adding watermark on video or image (add logo to video or photo), embedding image into video file, creating video from several images, editing audio. Videocharge Studio can edit video without reencoding as well. Videocharge Studio supports all existing video formats and can edit DVD or VOB files. It allows you to work via command line interpreter, extracts frames from video, creates thumbnail for video (for torrent video as well), sets metadata. The application supports a batch processing for editing a lot of files, can process all files in a folder, blur some area on the frame of video and remove watermarks from video. With the help of Watermark Master you can protect your videos and pictures by adding watermarks on every single video frame or image. At that you can edit hundreds of files by one click, add watermarks of different types (text, subtitles, image, video, animated GIF), apply various effects, for example, make watermarks move along the frame or smoothly appear and disappear, etc. Watermark Master can be used for batch video editing - it enables to insert a video scene (or graphic file) into any desired quantity of video clips by one click! Multifunctional library for video or graphical files editing! Watermark Master + SDK is a software product based on COM technology, thus and so any programming language that supports COM objects (C++, Visual Basic, JScript, Java, C##, etc) can be used for writing code. 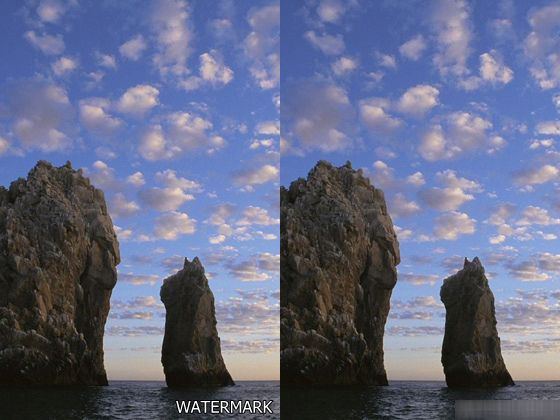 SDK includes all functionalities supported by Watermark Master software. Multifunctional application for editing tons of video files by one click. The software possesses a wide range of capabilities, which enables to perform any operations with bulk of video files by one click! It can be used for spliting audio and video files into smaller parts, joining a few media files into a single one, extracting or deleting scenes, creating thumbnails for video files, adding watermarks to video and image files, editing sequences of images. VideoCharge enables to edit videos on flow (without reencoding), supports working via command line, includes built-in FTP client. It is optimized for editing great amount of files and supports all basic video and image formats. VideoCharge Studio is a video editing software which enables to add a text (text watermark) onto a graphics file or every frame of a video film. Here the Curvature effect can be applied to the text.